The most exciting game of round 14 in the Premier League took place in Manama. This derby game ended with only one-point defeat on the road of second-ranked Al-Muharraq (10-2) to fourth ranked Al-Ahli (9-3) 75-74 on Tuesday evening. American-New Zealand forward Marcel Jones (203-85, college: Oregon St.) saved the victory with a double-double by scoring 29 points, 18 rebounds and 4 assists. The former international forward Hesham Sarhan (-92) contributed with 14 points for the winners. Ahmed Aldurazi replied with 17 points and 4 assists (was perfect 8-for-8 from the free throw line) for Al-Muharraq. Al-Ahli moved-up to third place, which they share with Al-Riffa. Al-Muharraq at the other side keeps the second position with two games lost. Al-Ahli is looking forward to face Al-Riffa (#3) on the road in the next round, which may be the game of the day. Al-Muharraq will play against Al-Najma and is hoping to win this game. Another interesting game was a derby match between two teams from Manama: Al-Najma (#5) and Al-Ittihad (#6). Al-Najma (6-6) won against visiting Al-Ittihad (5-7) 99-84. 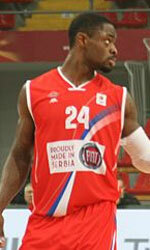 American Kevin Rogers (206-86, college: Baylor) had a double-double by scoring 33 points (!!! ), 17 rebounds and 5 assists to lead the charge for the winners and Mohamed Buallay chipped in 20 points, 12 rebounds and 11 assists during the contest. Bosnian-Serbian center Mile Ilic (215-84) responded with a double-double by scoring 33 points (!!!) and 16 rebounds. Al-Najma maintains fifth position with 6-6 record. Al-Ittihad lost third consecutive game. They dropped to the seventh place with seven games lost. Al-Najma will play against league's second-placed Al-Muharraq in Al Muharraq in the next round and it may be quite challenging game. Al-Ittihad will play at home against the league's leader Al-Manama (#1) and hopes to get back on the winning track. An interesting game for Al-Manama (12-0) which hosted in Manama 3rd ranked Al-Riffa (9-3). Top-ranked Al-Manama managed to get a 13-point victory 82-69. It ended at the same time the seven-game winning streak of Al-Riffa. Wayne Chism notched a double-double by scoring 27 points and 25 rebounds to lead the effort. Al-Manama's coach used a ten-player rotation which allowed the starters a little rest for the next games. Even 17 points, 8 rebounds and 4 assists (on 7-of-8 shooting from the field) by Yunes Kawaid did not help to save the game for Al-Riffa. Undefeated Al-Manama have an impressive 11-game winning streak. Defending champion maintains first position with 12-0 record. Loser Al-Riffa keeps the third place with three games lost. They share the position with Al-Ahli. Al-Manama's supporters look forward to an exciting derby game next round, where their team will travel locally in Manama to the arena Al-Ittihad. Another interesting game was a derby match between two teams from Manama: Al-Najma (#5) and Al-Ittihad (#6). Al-Najma (6-6) won against visiting Al-Ittihad (5-7) 99-84. Al-Najma players were unselfish on offense dishing 26 assists. American Kevin Rogers (206-86, college: Baylor) had a double-double by scoring 33 points (!!! ), 17 rebounds and 5 assists to lead the charge for the winners and international Mohamed Buallay (-95) chipped in 20 points, 12 rebounds and 11 assists during the contest. 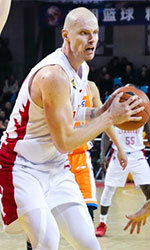 Bosnian-Serbian center Mile Ilic (215-84) responded with a double-double by scoring 33 points (!!!) and 16 rebounds and Ali Ghadeer produced a double-double by scoring 15 points, 10 rebounds and 6 assists. Al-Najma maintains fifth position with 6-6 record. Al-Ittihad lost third consecutive game. They dropped to the seventh place with seven games lost. Al-Najma will play against league's second-placed Al-Muharraq in Al Muharraq in the next round and it may be quite challenging game. Al-Ittihad will play at home against the league's leader Al-Manama (#1) and hopes to get back on the winning track. The most exciting game of round 14 in the Premier League took place in Manama. This derby game ended with only one-point defeat on the road of second-ranked Al-Muharraq (10-2) to fourth ranked Al-Ahli (9-3) 75-74 on Tuesday evening. American-New Zealand forward Marcel Jones (203-85, college: Oregon St.) saved the victory with a double-double by scoring 29 points, 18 rebounds and 4 assists. The former international forward Hesham Sarhan (-92) contributed with 14 points for the winners. Ahmed Aldurazi replied with 17 points and 4 assists (was perfect 8-for-8 from the free throw line) and the former international center Chester Giles (211-85, college: Oregon St.) added 3 points and 19 rebounds in the effort for Al-Muharraq. Both teams had four players each who scored in double figures. Al-Ahli moved-up to third place, which they share with Al-Riffa. Al-Muharraq at the other side keeps the second position with two games lost. Al-Ahli is looking forward to face Al-Riffa (#3) on the road in the next round, which may be the game of the day. Al-Muharraq will play against Al-Najma and is hoping to win this game. An interesting game for Al-Manama (12-0) which hosted in Manama 3rd ranked Al-Riffa (9-3). Top-ranked Al-Manama managed to get a 13-point victory 82-69. It ended at the same time the seven-game winning streak of Al-Riffa. International Wayne Chism (206-87, college: Tennessee) notched a double-double by scoring 27 points and 25 rebounds to lead the effort and the former international forward Ahmed Ismaeel (203-90) supported him with 22 points. Al-Manama's coach used a ten-player rotation which allowed the starters a little rest for the next games. Even 17 points, 8 rebounds and 4 assists (on 7-of-8 shooting from the field) by the former international forward Yunes Kawaid (-88) did not help to save the game for Al-Riffa. American forward Haminn Quaintance (206-85, college: Kent St.) added 14 points and 6 rebounds for the guests. Four Al-Riffa players scored in double figures. Al-Manama have an impressive 11-game winning streak. Defending champion maintains first position with 12-0 record. Loser Al-Riffa keeps the third place with three games lost. They share the position with Al-Ahli. Al-Manama's supporters look forward to an exciting derby game next round, where their team will travel locally in Manama to the arena Al-Ittihad.